Teaching 6 different grade levels has me covering a lot of different science topics and concepts. Whether it be a certain standard that you need to cover or just need some ideas for what to do in science this week, I have you covered. 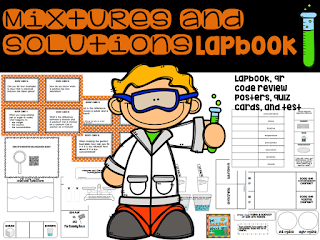 I will be sharing a new blog series that will help you find ways to make Science child's play! Kids love chemical reactions however, I think they are always waiting for something to explode. 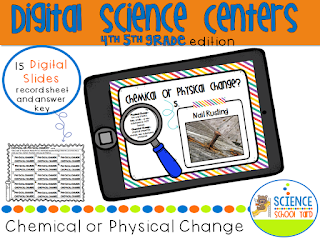 You can easily find ways to cover the NGSS concept of structures of matter...more specifically chemical vs. physical change...without anyone or anything blowing up! In order for students to really grasp the idea of what they see or don't see, you need to focus on helping them understand the vocabulary words they will be hearing as well as demonstrating. Grab some dollar store glow sticks and teach the concept behind how they glow and you have your first idea. Grab Cranberry Juice, citric acid, and baking soda and you are onto your second idea! Grab some pennies and some liquids and show how acids clean pennies in this quick chemical reaction activity! Make sure you have ketchup because it does an amazingly quick job getting any patina off of a penny! I also love vinegar, baking soda and water, Coke, window cleaner, and water as a control. You can always add different liquids that you have. Bath Bombs are all the "bomb"! With any holiday from Mother's Day to Christmas you can make this with your kiddos and send home a little gift! And don't forget good ole' Oobleck or Slime! 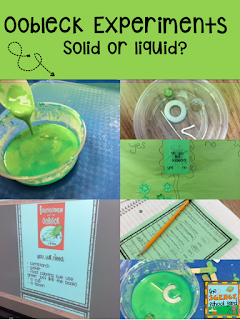 Oobleck is a great way to teach non-Newtonian Fluids and all you need is corn starch and water and a little food coloring! Find the pack full of fun Oobleck Connections HERE. 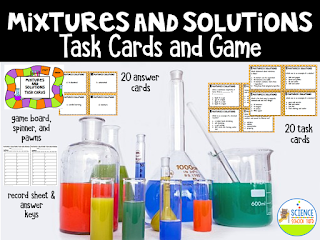 Now, I have to say we use the FOSS mixtures and solutions kit for our chemical experiments, but if you don't have this kit then here are some great ideas for quick and easy chemical reaction observations that are inexpensive and kids love them! I use open and closed systems as a way to compare a plastic baggie and a cup with vinegar and baking soda because they are able to understand the difference. You can also teach Natural Disasters and how humans can protect themselves by making volcanoes. All you need is baking soda and vinegar! -Create boats that are propelled by baking soda and vinegar which is another creative take on these two ingredients, but with a STEM twist! 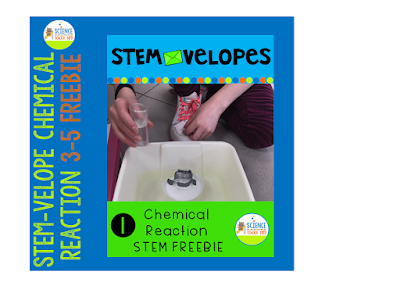 Sign up for my newsletter and get this experiment free in my Science School Yard Library! -I love Mentos and Coke as well as Alka Seltzer and Water in old film canisters, too! Find the Alka Seltzer Rocket Lab HERE! It is always hard to find easy and affordable ideas to teach a concept such as structures of matter, but with a little creativity and some help from the Science School Yard, you can find easy ways to teach chemical reactions! Know any other easy chemical reaction recipes or demonstrations you use? Share below. We would love to add to our list with your help!